Marker Text: The Old Governor’s Mansion served as Georgia’s Executive Mansion from 1839-1868. Designed by architect Charles Cluskey, the Mansion is built in the High Greek Revival Style. The Mansion served as the residence of eight governors, their families, and their slaves and free servants. The building was a symbol of Georgia’s economic prosperity as the “Empire State of the South” during the antebellum period. In the Civil War, during Major General William T Sherman’s March to the Sea, the Mansion was captured by U.S. forces and served as his headquarters on November 23, 1864. In 1889, the Old Governor’s Mansion became the founding building of what would later become Georgia College & State University. Designated a National Historic Landmark in 1973, the Old Governor’s Mansion was restored to its c.1851 appearance in 2004 for use as a museum. 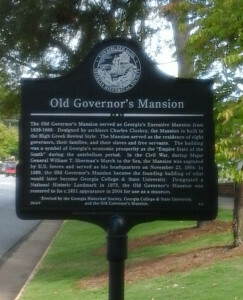 Erected by The Georgia Historical Society, Georgia College & State University, and The Old Governor’s Mansion. Tips for Finding This Marker: On South Clark Street (U.S. 441) 0 miles north of West Greene Street, on the right when traveling north in Milledgeville.